CRISPIN and CRISPINIAN, Roman missionaries in the area around Soisson in present-day France. Beheaded at Soisson circa 285–287, their cultus enjoyed great popularity in the Middle Ages, as memorialised by Shakespeare in King Henry’s address to his troops prior to the Battle of Agincourt ( Henry V Act IV Scene iii ). The later adoption of the Roman Calendar in which the Feast of the Martyrs SS. Chrysanthus and Darias took precedence, led to the liturgical celebration of their feast being superseded. SS. Crispin and Crispinian supported themselves as shoemakers, and are the Patron Saints of shoemakers, saddlers, and tanners. They are often said to have been brothers, and possibly members of the Roman Nobility, though there is no evidence to support this. CYRINUS (of ROME), a victim of the Diocletianic Persecution, St. Cyrinus was martyred in Rome in the late third century. DULCARDUS, a monk at Abbey of Saint-Mesmin, Micy, near Orleans. St. Dulcardus spent the last years of his life as a hermit in what later became the village of Saint-Doulchard, just north-west of present-day Bourges, France. St. Dulcardus reposed in 584. FRONTO and GEORGE (of PÉRIGUEUX) , according to the Martyrology of Ado (circa 858), and the 1914 edition of the Roman Martyrology St. Fronto, a bishop, was baptised by St. Peter (29th June) and then sent by the Apostle, along with St. George, a priest, to preach the Gospel to the Périgueux, serving as the first Bishop of that See, and reposing in the first century. According to some later traditions St. George was the founder of the church at Le Puy-en-Velay. According to some hagiographies (circa 10th–13th century), St. Fronto flourished in the mid- to late-third century and was dispatched to Périgueux to help the Christian community there recover from the Decian Persecution. GAUDENTIUS of BRESCIA, the successor to St. Philastrius (18th July) as Bishop of Brescia, receiving consecration at the hands of St. Ambrose (7th December) circa 387. St. Guadentius reposed somewhere between 410 and 420. We are fortunate that some of his sermons, including ten of his Easter sermons, has survived. GOEZNOVEUS, a native of Cornwall and brother of St. Meugant (26th September). St. Goeznoveus went to Brittany and was later consecrated Bishop of Léon. He reposed in 675. GUESNOVEUS (GOUERNOU), a Bishop of Quimper in Brittany, and founder of a monastery of some renown near Brest. St. Guesnoveus reposed at his monastery in 675. HILARY of JAVOLS, (Sixth Century), one of the last Bishops of Javols before it was subsumed by the Diocese of Mende. There is no further information on his life extant. HILARY of MENDE, an adult convert who lived as a hermit on the banks of the River Tarn in southern present-day France. St. Hilary built a monastery for the disciples who joined him, but then left to live at the Abbey of Our Lady of Lérins to gain better knowledge of their monastic rule. Returning to his monastery, he was consecrated Bishop of Mende. St. Hilary reposed in 535. HILDEMARCA, St. Hildemarca was Abbess of St. Eulalia Abbey in Bordeaux, when St. Wandrille (22nd July) appointed her to serve as Abbess of the new Abbey of the Trinity of Fécamp (Abbaye de la Trinité de Fécamp). St. Hildemarca reposed circa 670. LUPUS of BAYEUX, fourth Bishop of Bayeux (circa 434–464). MARTYRS of ROME , a group of forty-six soldiers and twenty-one civilians martyred in Rome in 269, during the reign of Claudius II (r. 268–270). MINIATO (MINIAS), considered the first Florentine martyr, St. Miniato was a soldier stationed in Florence who energetically evangelised his fellow soldiers. St. Miniato was martyred during the Decian Persecution (circa 250). It is said he was subjected to extreme torture prior to his execution. The Basilica of San Miniato al Monte in Florence is dedicated to him. PROTUS and JANUARIUS, Ordained by Pope St. Caius (22nd April), Protus to the priesthood, and Januarius to the deaconate, the saints laboured to evangelise their native Sardinia. Whilst their work was quite fruitful, they were martyred by decapitation at Porto Torres on the north-west coast of Sardinia during the Diocletianic Persecution in 303. 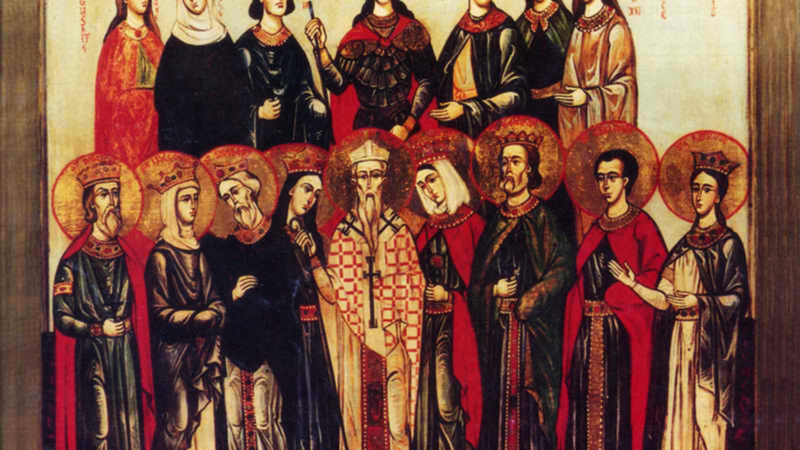 THEODOSIUS, LUCIUS, MARK, and PETER, of a group of fifty soldiers martyred in 269 at Rome during the reign of Claudius II (r. 268–270), only the names of these four saints are known to us.